The Hon. Conrad K. Cyr (center), retired 1st US. 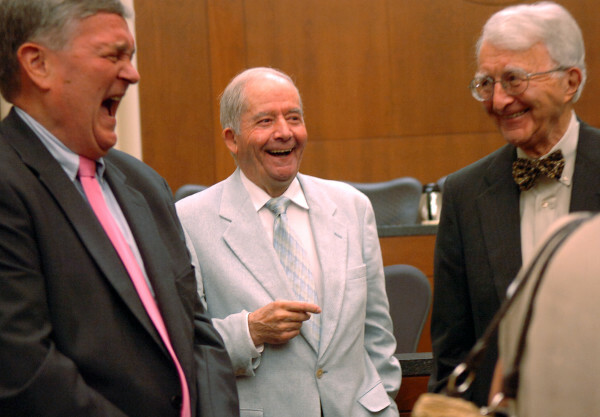 Circuit Court of Appeals judge, shares a laugh with U.S District Judge D. Brock Hornby (left) and Ralph I. Lancaster Jr., president of the U.S. Supreme Court Historical Society, at U.S. District Court in Bangor in August 2009 at the unveiling and presentation of Cyr's portrait. Cyr died Thursday at the age of 84. 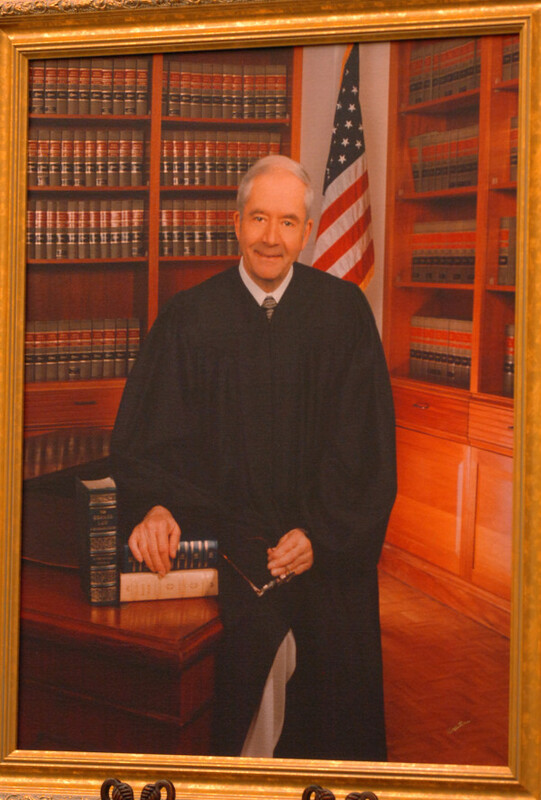 This portrait of Conrad K. Cyr hangs in the federal courtroom in Bangor where Cyr served from 1981 to 1989. Cyr died Thursday at the age of 84. BANGOR, Maine — A Limestone native who began his legal career in an office over the family department store and rose to the 1st U.S. Circuit Court of Appeals has died. Conrad Keefe Cyr died Thursday at the age of 84 surrounded by his family at home, according to his obituary. Cyr served as a federal prosecutor, bankruptcy judge and U.S. District judge in Bangor. He spoke fondly of his years spent working on the third floor of the Margaret Chase Smith Federal Building in August 2009, when his portrait unveiled. Nancy Torresen, chief judge of U.S. District Court in Maine, clerked for Cyr in 1987 and 1988. “In legal circles, Judge Cyr was known as a formidably intelligent, very serious man, but he also had a light-hearted, human side,” she said in an email Saturday. “Judge Cyr had a practice of eating lunch with his law clerks and his court reporter. Rain or shine, we would walk to one of the local Bangor eateries and take a break from the books for an hour. We would swap stories, tell jokes, and just enjoy being out in public. Cyr graduated from Limestone High School in 1949 and the College of the Holy Cross in Worcester, Massachusetts, in 1953. Three years later, he earned his law degree from Yale University in New Haven, Connecticut. Cyr moved in 1959 to Bangor, where he worked as a federal prosecutor until 1961, when he became a referee for the bankruptcy court. He also helped write the rules for bankruptcy court and the legislation that created the U.S. Bankruptcy Court in its present form and which included judges rather than referees. In 1973, he was appointed a U.S. bankruptcy judge for Maine. During his tenure as a bankruptcy judge, Cyr founded the American Bankruptcy Law Journal. In November 2008, he received the Norton Judicial Excellence Award, which recognizes lifetime achievement in scholarship, writing and service to the bankruptcy system. President Ronald Reagan appointed Cyr to the U.S. District Court bench in 1981. He served in that position until 1989, when President George H.W. Bush appointed him to succeed Frank Coffin on the appellate court in Boston. Cyr took senior status in early 1997 and retired in 2008. “Judge Conrad Cyr was an extraordinarily well-regarded, fair-minded jurist who demonstrated his love and respect for the rule of law throughout his decades of distinguished service. He also never forgot his Aroostook County roots,” U.S. Sen. Susan Collins said in a statement Sunday afternoon. “His passing is a loss to his family and friends, the State of Maine, and all who had the pleasure of knowing him,” Collins said. Calling hours will be from 4 to 7 p.m. Tuesday at the Brookings Smith Funeral Home, 133 Center St., in Bangor and from 4 to 7 p.m. Wednesday at the Giberson-Dorsey Funeral Home, 144 Main St., in Fort Fairfield. A funeral Mass will be celebrated at 11 a.m. Thursday at St. Louis Catholic Church, 106 Main St., in Limestone. Burial will follow in St. Louis cemetery. Those who wish may make a donation in Cyr’s name to the Fisher Center for Alzheimer’s Research Foundation, 110 East 42nd Street, New York, NY 10017.